Joining a Community Supported Agriculture-model farm means more than getting your hands on fresh, locally grown vegetables for 25 weeks. Membership in a CSA brings with it a sense of community, a feeling of reconnecting with the land and an opportunity for respite from the busyness of our lives. When you become a member of a CSA, you agree to support the farmer in his or her endeavors while accepting both the rewards and the risks of the growing season. Without a doubt, in good years there is an abundance of produce. One August week in 2009, La Vista provided each shareholder with 35 tomatoes bursting with the sweet taste of summer. We gathered quarts of green beans from the U-Pick field and brought home bouquets of cut wildflowers. In the less bountiful years we can be satisfied knowing that whatever we receive has been produced using sustainable growing methods without traveling hundreds of miles to reach us. But there are benefits to being a member of La Vista that go beyond receiving luscious organic vegetables every week. Fostering a sense of community is equally important. We mark the passing of each growing season by our shareholder gatherings: The Welcome and Orientation in May; the occasional barbecue in June; the August Tomato Fest with its tomato-themed games and recipe contest; and the Harvest Party that signals the closing of the season in November. Each is designed to bring members together, sharing food and fellowship in a celebration of what the land has to offer us. 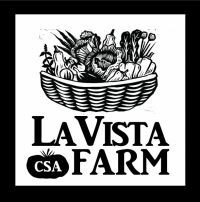 La Vista encourages shareholders to volunteer three hours a month to support the farmer, whether that is through office work, fieldwork, publicity efforts or other ways that make use of their talents. In lieu of volunteering, shareholders may offer a monetary contribution. When shareholders actively participate in ways that are meaningful to us, we have the satisfaction of knowing we contributed directly in growing some of the food we eat. We also gain a sense of being part of something larger than ourselves as we provide nutritious food for members of the garden as well as the surrounding community. 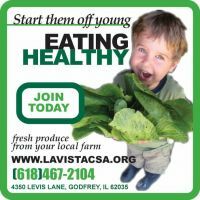 One of La Vista’s missions is to offer a percentage of our shares to low-income members in the area as well as to share excess produce with the local food pantry. Doing so brings the fight against hunger to a local level. Located on private property, La Vista offers shareholders a break from the frenetic activities of our lives, the to-do lists that never seem to end. Once we enter its gate and drive down the lane, we get into a completely different state of mind. We automatically reduce our speed and turn down the radio. Picking vegetables in the field with the soft buzz of insects and birds’ songs in the background is almost an act of meditation as our mind quiets and we search for just the right-sized okra pod hiding among the stalks or a sweet cherry tomato nestled among the vines. As each season comes to an end, we look back on the harvest we reaped over the months even as we look forward to the benefits La Vista will bring us in the coming year – the tangible as well as the intangible.